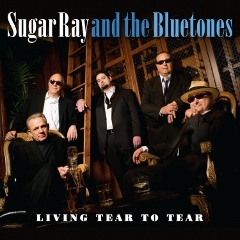 We’ve all heard the adage “The more things change, the more they stay the same”, and perhaps no blues band today more resembles that comment than the storied Sugar Ray and the Bluetones, who have certainly seen their share of change in the now three and a half decades since their formation. 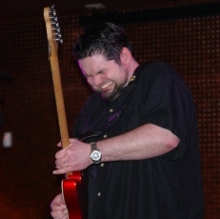 Among those changes of course have been numerous shufflings in personnel, with the Bluetones’ founding guitarist – a fellow by the name of Ronnie Earl – leaving the band relatively early in its history to replace Duke Robillard in another New England-based outfit, Roomful of Blues, and original drummer Neil Gouvin making a similarly hasty exit, going on to record with the likes of Luther Allison, Otis Grand, Debbie Davies, and former bandmate Earl. 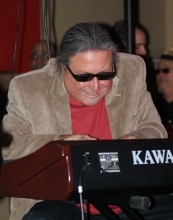 And even bandleader, vocalist and harmonica player Sugar Ray Norcia spent some time with another band during the 1990s when he served as lead singer for Roomful of Blues (with former bandmate Earl having already set off on his own by Norcia’s arrival). So it’s pretty amazing really that four of the five musicians who play on the Bluetones’ new album Living Tear to Tear (Severn Records) also happen to be four of the band’s original members – finding Norcia on vocals and harmonica, Michael “Mudcat” Ward on bass, Anthony Geraci on keyboards, and Gouvin back on drums, all of whom celebrate their 60th birthdays in 2014 – with Earl’s spot on guitar having been filled by a series of other faces through the years until the band brought on its current guitarist in 2001, a brilliant young player in Monster Mike Welch. As you might expect from a band that’s played together for so long (even the “new” member Welch has been with them now for more than a decade), the Bluetones are about as tight a band musically as you could ask for, both live (as we had the chance to observe when we caught them this winter during the Lancaster Roots & Blues Festival, where we shot these pics) as well as in the studio, as Living Tear to Tear once again proves. Whether you attribute it to their many years of experience playing together, the professionalism of its individual members, or both, the band is also one of the best we’ve seen or heard at being able to grab a listener’s attention and maintain it, tearing from one great song to the next with ease. Take, for example, this latest CD: it all kicks off with the raucous roadhouse swing of “Rat Trap”, followed by the swaying, soulful Mike Welch-penned “Here We Go”, and then on to the gritty midtempo cooker “Things Could Be Worse”, which really helps put things into perspective with its chorus of “you should quit your complainin’, and be thankful first/ because for every bad, I know there’s a worse”. From there, they move to the shuffling, steady groove of the album’s title track, while perhaps no tune better says the blues than the tough sounds, vocals and lyrics of the slow, simmering “Misery”, which, clocking in at just over eight minutes, ensures that listeners get their money’s worth in every way. One other way the band does that is by including songs written by four of the five musicians, with bassist Mudcat Ward’s contribution coming in the deep, swaying, somewhat autobiographical thought-provoker “It’s Never as Bad as It Looks” detailing some of the extremes the band has seen through the years (the second part of the chorus being “ain’t never as good as it seems”). There’s also a tasty instrumental in “Short Ribs” while the creeping “I Dreamed Last Night” is another impressive slow blues tune, one of two songs – along with the terrific title track – written by keyboardist Geraci, whose exquisite work on piano also nicely complements Welch’s passionate guitar and the plaintive wails of Norcia’s harmonica. That’s followed by a solid take on the Sonny Boy Williamson classic “Ninety Nine”, a bit of a country ballad in “Our Story”, and the jazzy “Hungry But Happy” with its moral of “Give me a cold dinner with some lovin’, not a good hot meal and a cold, cold wife” before the album concludes on the distorted vocals and sweltering blues of “Nothing But the Devil” (Lightnin’ Slim, Johnny Winter). As usual with this band of brothers, the solos are modest and well-chosen, with the mixing and mastering (or lack of it, according to Ward, who told us in our exclusive interview with him that Living Tear to Tear may represent the best example of the band’s abilities yet, recorded live in the studio in “mostly first – and only – takes”) allowing each of these talented musicians to be heard distinctly without drowning out any of their colleagues. Here’s our full Q&A with the band’s longtime bassist Michael “Mudcat” Ward, who has appeared on more than 50 albums to-date, including Hubert Sumlin’s Grammy-nominated About Them Shoes, where we talk about the band’s history, some of the artists with whom he’s played – and one he never had the chance to – over the years, and how he got his start on the bass, among other topics. The BluesPowR Blog (BluesPowR): Hi, Mudcat. Thanks for taking the time to answer some questions. First, how’d you get the nickname “Mudcat”? Michael “Mudcat” Ward (MMW): “Mudcat” is simply a nickname, with no real significance. During one of his stays with Ronnie Earl and me in 1979 to play Massachusetts and Rhode Island, over a bottle of Seagrams VO, we asked Big Walter Horton if he had an idea for a nickname for me. He proffered “Shorty” off the top of his head, perhaps thinking of the great Chicago bassist Lafayette “Shorty” Gilbert (Howlin’ Wolf, Eddie Shaw). Odd choice for me, measuring in at 5’11” in my stocking feet at the time. Needless to say, that name didn’t stick. I opted for Mudcat (or Mud or Cat) and it’s been a name I’ve been answering to ever since. Seems like a befitting and respectable handle for a bass player holding down the bottom. BluesPowR: The band is celebrating its 35th anniversary in 2014 with the release of your sixth album on Severn Records, Living Tear to Tear. Do you have a favorite song off the new album? MMW: My favorite cut on the most recent CD is “Misery”, written by Sugar Ray Norcia, and fully improvised by every player in the moment of the recording session. It’s a slow blues in B natural, but beyond that generic description, it exemplifies what contemporaneous, improvisational blues playing is all about. Reactions from each player in different spaces, calls and responses, goading, playing off of, responding – the fundamental interaction of all the players creates a viscerally exciting experience and is a deep part of the tradition which, in my view, has seen a lot of loss in recent times. BluesPowR: Four of the five musicians who play on this album are original members of the band, with guitarist Monster Mike Welch having joined the rest of you in 2001. What is it about this particular group of guys that has kept you together/coming back together this long, and what has Welch brought to the band? How does he compare to the band’s original guitarist, Ronnie Earl? MMW: The four “original members” were on the road before Monster Mike was even born. That’s truly hard to fathom. But we’ve known him an awfully long time. Drummer Neil Gouvin and I were involved in a recording session set up for Mike in Memphis when he was very young, under the auspices of the original House of Blues. We worked with Jim Dickinson, great producer and great piano player. The famous Memphis Horns were also a part of it, and it was indeed an incredible experience. The recording, alas, never was released. I wrote a song for Mike for that session inspired by the recent death of Albert King (“Memphis Mourns Albert”) on which Jim Dickinson played exquisite piano. I knew even then that Mike would become an important part of the American blues lineage, so to speak. I can’t compare him to Ronnie Earl nor can I compare Ronnie Earl to Mike Welch. They are very different players, different types of players, both with an unbending respect for all styles of blues and the players who created and create it. They carry on the tradition with relentless dignity. BluesPowR: You nicely document the band’s early history on the Bluetones website, in which you relate such stories as the whole band having to share a single motel room and limiting your survival to a diet of potato chips and coffee, having to enlist a U.S. consulate official’s help to get paid for a gig in Spain, and being cheated out of royalty payments by a record label; what kept you and the band going through these kinds of challenges and since? MMW: Our love of the music, of blues, quite simply has kept us going amidst all the challenges. We love to play. In my case, I still feel I need to play. BluesPowR: You wrote the song “It’s Never as Bad as It Looks” that appears on the new album. This is obviously somewhat autobiograhical – talking about driving in broke-down clunkers and traveling from Maine to California one week and then on to Canada to New Orleans the following – as well as a good way of approaching life. Is there anything more you’d care to offer on that song’s lyrics or songwriting in general? MMW: It may be that all blues songs are autobiographical, some to more of a degree than others. When I wrote “(I’m Gonna Break Into) Folsom Prison” (Hands Across the Table), obviously I wasn’t writing in a literal sense, but the underlying message of the devastation of outsourcing is what I meant to convey, if figuratively. Or, to take another example, when I wrote “Burial Season” (from Sugar Ray and the Bluetones featuring Monster Mike Welch), it was infused by very real events in the world at that time, including the deaths of my sister-in-law, the Boston blues disc jockey Mai Cramer, and the mother of a friend, the late harmonica player, John McGrath. An instrumental, inspired by what took place in NYC – “From Now On This Morning (11 September)” (from the same album), has a very personal connection with me. In a different sense, I wrote “Hope Valley” (heard on the Bluetones’ first album Knockout on Rounder Records) about Sugar’s hometown. All autobiographical but in not-so-similar ways. BluesPowR: Is there any one particular song from the band’s history you most enjoy playing live? MMW: There really isn’t a song I like playing best. I do like when Sugar Ray decides to call off a number we haven’t played in ten or even twenty years, which can happen, and which is an amazing thing to be able to do when you think about it. Right now we are consciously trying to play the material off the latest CD, but there is an immense amount of songs that we have played over the years—more than we can remember, actually. There’s a lot to draw from. Also, Sugar isn’t afraid to play a traditional blues number we might know from hearing in the past or in the van, say, but one we may never have performed before. Believe me when I say it is usually an incredible performance and speaks volumes to the mastery of the idiom by these five consummate blues players. BluesPowR: Through the band and individually, you’ve had the opportunity to support such artists as Hubert Sumlin, Junior Wells, Buddy Guy, Memphis Slim, James Cotton, Lowell Fulson, Otis Rush, Big Mama Thornton, Big Walter Horton, J.B. Hutto, and Big Joe Turner. Is there one artist with whom you never got a chance to play that you wish you could have? MMW: I never had the chance to play with Otis Spann, and I just wasn’t born soon enough to make that possible. I did make two CDs with another Muddy Waters piano-playing alumnus, Pinetop Perkins, which was an honor indeed. BluesPowR: Any advice for aspiring young blues artists? Is there anything else you’d care to add? MMW: I can’t offer much in the way of advice. I owe a lot to guitarist Ronnie Earl, obviously perhaps, and pianist/organist Benmont Tench of Tom Petty’s Heartbreakers, not so obviously, perhaps. Here’s why: I went to a boarding school in the 10th grade. I had some gigging experience as a piano player, and in the new school, searched for blues players of any sort that I could play with. The best (and only) band of musicians with any desire to play blues included Ben Tench, whose piano-playing abilities far outshined mine back then (and still do.) The group needed a bass player, and Ben told me if I could exchange my electric piano for a bass guitar during the Thanksgiving break, I could have the gig. I followed his instructions, made the switch in a pawn shop in Lewiston, Maine, and returned to find I was holding down the bass chair that very next weekend. I had to learn fast. That was the humble beginning of my journey playing blues bass. BluesPowR: Are there any albums you feel best represent the band’s abilities or sound, particularly for new listeners? MMW: I think this latest CD, Living Tear To Tear, is the best example of the band for a couple of reasons. One, it was recorded “live” in the studio, mostly first (and only) takes, and it is real, sincere, heartfelt and unaltered or undoctored from an engineering standpoint. The second reason: the CD experience is a very close representation to hearing the current band – not always the case for bands, or for us. Earlier CDs, however great musically, do not all accurately reflect the band you can expect to see live in concert, with either maybe a different guitarist, or perhaps a horn section. We do appear live on occasion with horns, but that is infrequent (and depends upon the gig and its finances). And third, the contents of the music, whether original or the few covers, are, in my view, blue and traditional, and manifestly without efforts to be commercial. The identity of the band the Bluetones really is present. This entry was posted in Albums, Interviews and tagged Anthony Geraci, Michael Mudcat Ward, Monster Mike Welch, Neil Gouvin, Ronnie Earl, Sugar Ray & the Bluetones, Sugar Ray Norcia. Bookmark the permalink.